I have some new work on the Federal Election Commission forthcoming in the UC-Irvine Law Review. (The paper is not yet published.) The article focuses on the FEC’s Advisory Opinion process. Background info on FEC Advisory Opinions is here, but it is basically a formalized way for political actors (candidates, party committees, and interest groups) to get feedback on the legality of proposed campaign finance activity. The FEC posts all of their AOs, and I read and coded all 1200+ issued between 1977 and 2012. Most of that was for my book on interest groups, but the Law Review piece updates and extends the analysis. One feature of the data-set I’ve assembled is a list of all cited AOs in each issued opinion. The FEC will bolster its legal argument by making reference to previously issued opinions that are similar on point or focus. 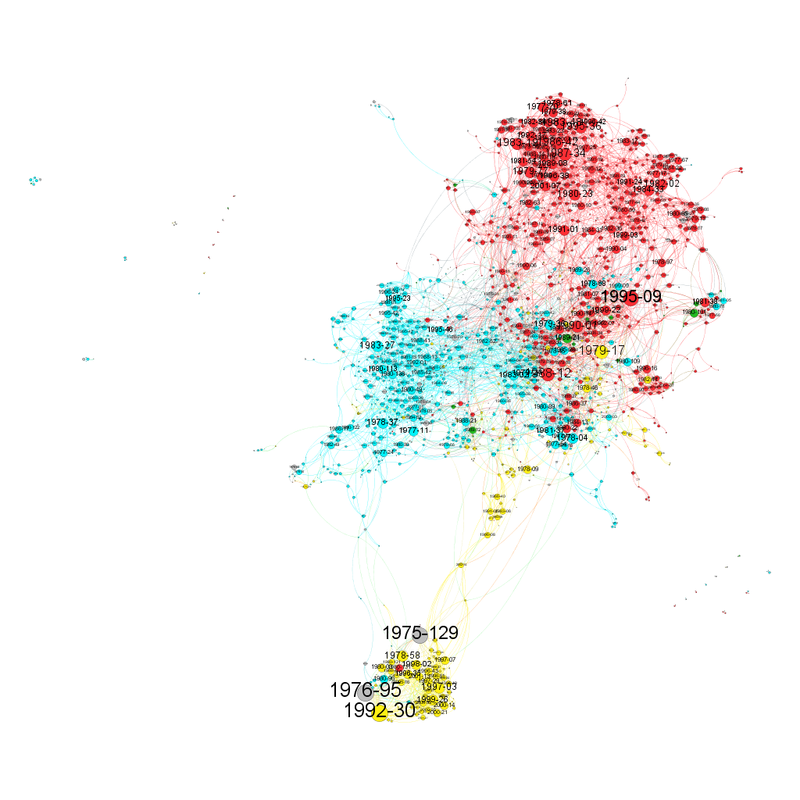 This creates the opportunity for a network map of citation linkages. I’m including that below. Click here for a link to the file. This graph is not included in the paper, so consider it a Bonus Feature. The blue nodes are candidate requests. The reds are interest group requests; and the yellows are party requests. Some gray nodes are ones I just didn’t code (usually pre-1977). Any line drawn from one to another is a citation link between the two opinions (one cited the other). Larger nodes (and labels) indicate that the opinion was cited more often by other AOs. 1. There are distinct clusters by requester-type. Candidate requests cluster together; groups cluster; and parties cluster. And in fact, parties seem the most distinct, since their cluster is situated a bit farther apart from the other two. This is expected, but not obvious. If everyone was asking about how to raise money online, for example, there would a lot of citations across requester-type. The FEC would bolster its argument to an interest group by making note of candidate x’s similar request and party y’s similar request. There would be a lot of overlap across requests. There instead seems to be domains of questions that remain within requester-type as opposed to across them. 2. There are not a lot of BIG opinions. I thought I would find a few HUGE AOs that would be canonical opinions. A sort of “controlling legal authority“-type set of opinions on a few big issues. And there are AOs that are more frequently cited than others (see point 3). But my look at the graph sees a lot of citations across a wide range of opinions. That means that there are a lot of questions, and a lot of distinct questions that raise legal issues not previously covered by other AOs. That might make sense if we see the AO as “answering” a question that need not be covered with subsequent, related questions. I might interpret that to mean that political actors (and their legal counsel) are reading these and using them to inform their campaign activity. No need to ask the question, in other words, if it’s already been answered. 1995-09 (the NewtWatch PAC opinion)–this, if any, comes closest to being a canonical opinion. The data are just a lot of fun to play with. It may not tell us too much about the structure of campaign finance. But I’m convinced it tells us something. Let me know if you have any questions. The graph was made with gephi, which is free and open-source! In fact, I used the data as an opportunity to learn gephi, so I’m not taking full advantage of the software (reporting on the diagnostics of the network plot, for example. I need to learn all that good stuff).